The concept of the sister city started sometime in the 1950s, but a lot of people tend only to know the term from browsing a town’s Wikipedia page. New York and Beijing are sister cities, as are Paris and Seoul, as well as Krakow and Edinburgh. This particular bond between cities is meant to strengthen relations between two cities, two states, and two nations. Not far from where I live, the city of Hackensack, New Jersey (yes, the one from Billy Joel’s Movin’ Out) is sister cities with a Bavarian city called Passau. It’s very rare for two sister cities to… divorce, I guess? Disown each other? I’m not sure what to call it. To stop being sister cities. To dissolve their bond. San Francisco and Osaka became sister cities sixty years ago in 1957. It had been twelve years after the Japanese surrender in 1945 that ended the war in the Pacific Theater, and the United States and Japan were beginning to realize their full reconciliation. But recently, the relationship between the two countries has been put under some strain because of the relationship between the two cities, San Francisco and Osaka. All because of a statue. Well, it’s not just the statue. To judge the friendliness or hostility of another state based on taste in art has never been tested. If that were true, every city with at least one example of postmodern architecture would be internationally isolated (I’m looking at you Burbank, and your Team Disney building). The San Francisco statue in question is called the Women’s Column of Strength. It was designed by Steven Whyte, a sculptor based in Carmel, CA. He’s best known for works like his bust of Martin Luther King Jr. in Fontana, CA known as The Column of Knowledge. What has been so controversial to the Japanese is that the work was commissioned by the Comfort Women Justice Coalition. 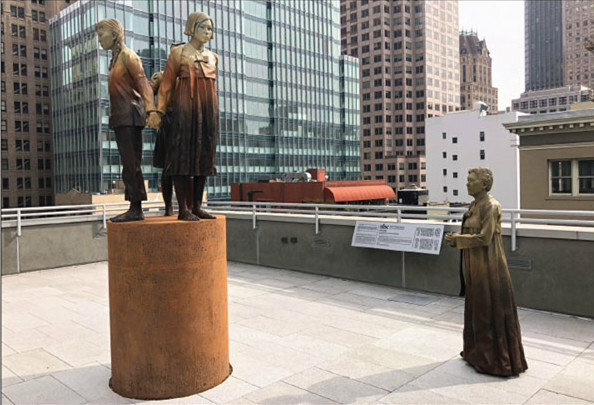 The statue, which was recently declared city property by San Francisco, commemorates the estimated 200,000 foreign women and girls that served as comfort women in the service of the Imperial Japanese Army during the Second World War. These women and girls, coming from nations that the Japanese had occupied during the war including Korea, China, Thailand, the Philippines, and Indonesia, were forced into sexual slavery to work in brothels run by the Army. The subject of comfort women has always been a touchy subject. War crimes committed by the Japanese in general, namely the atrocities committed in the Chinese city of Nanking, were routinely swept under the rug until the 1990s, when surviving victims began to speak out. In 1993, the Japanese government issued a statement taking responsibility and asking forgiveness for the horrendous practice of recruiting and keeping comfort women. Despite this statement, statues and other memorials to comfort women erected in South Korea, Australia, Germany, and the United States have always been met with severe disapproval by the Japanese. The very first memorial commemorating comfort women in the United States was unveiled in Palisades Park, New Jersey (again, not far from where I live). A small plaque on a rock placed in 2010 was met with two different Japanese delegations unsuccessfully visiting the local city government to have it removed. 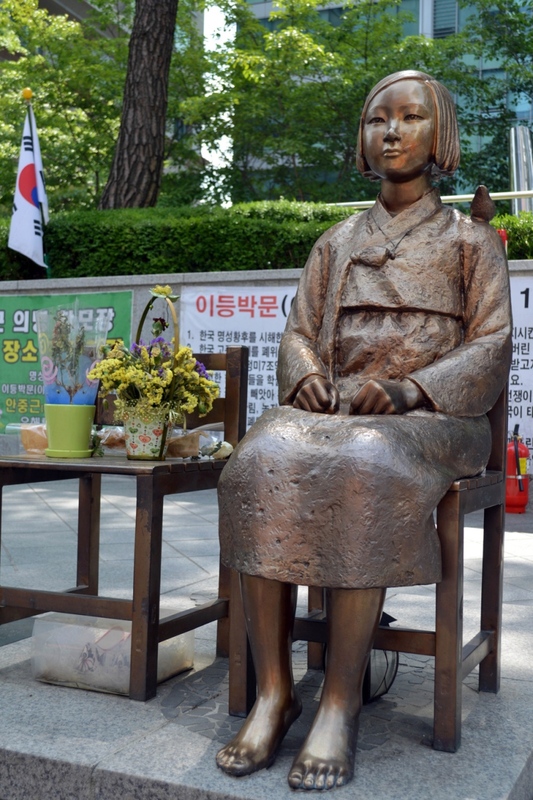 But the most controversial commemoration of comfort women came in 2011. Every Wednesday since 8 January 1992, surviving Korean comfort women and their supporters have gathered in front of the Japanese embassy in Seoul to protest Japanese denial of formal government involvement in the establishment and operation of comfort women brothels. On the 1,000th protest in December 2011, the protestors unveiled a statue of their own: a seated girl with a small bird on her shoulder looking directly at the embassy. The protestors have also demanded one billion yen in compensation to South Korean comfort women. The Japanese have denied compensation until the statue is removed. While the outcry over the statue in San Francisco is no different than any other incident involving these statues and monuments, the Mayor of Osaka has threatened to terminate Osaka’s sister city status with San Francisco, which has never been threatened before. While these artworks can cause such diplomatic tensions, they need to be created and remembered, so that way people will know and remember atrocities like the use of comfort women. Horrendous acts perpetrated by any government should be recognized, and publicly so, like the city of San Francisco has done. I would hope that the statue remains standing in Saint Mary’s Square in San Francisco not only to commemorate, but to educate. Nathan Scheer is contributor to The Artoholic and a webmaster for TheArtExperts.org, who is currently studying History and International Studies at Elon University in North Carolina. He has also worked for Rehs Galleries, Inc. and Rehs Contemporary Galleries, Inc., which specialize in 19th and 20th Century European paintings and contemporary academic paintings, respectively, as well as Christie's Rockefeller Center.